Tommorow marks the 15th anniversary of the Srebrenica genocide - the first and only genocide in Europe since the Holocaust. 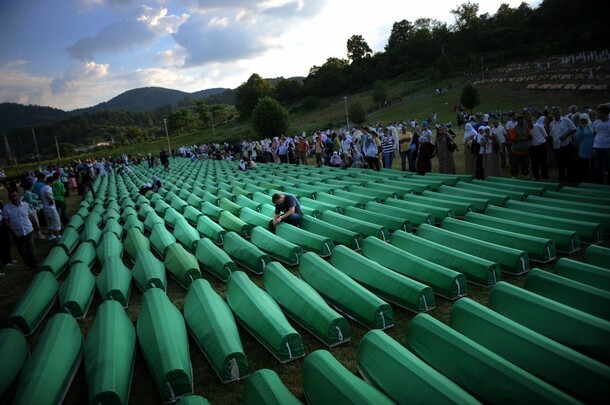 So far some 3,831 DNA identified victims have been buried at the Srebrenica Genocide Memorial in Potocari. That number will rise to 4,606 tomorrow, when 774 Bosniaks (Bosnian Muslims) and one Croat (Bosnian Catholic) are finaly laid to rest as victims of the 1995 Srebrenica genocide. Rudolf Hren (Catholic) [casket #257] lived in Srebrenica before and during the war and he will be buried among his Muslim friends with Christian (Catholic) insignia marking his grave. Muslim and Catholic priests - mufti Husein ef. Kavazović and fra Martin from Tuzla - will be present to commemorate more than 8,000 victims the Srebrenica genocide. A Catholic cross, honoring Rudolf Hren, is more than welcome in the Srebrenica Genocide Memorial. Srebrenica's Muslim priest, Damir ef. Peštalić, said that Hren will be laid to rest half an hour before the commemoration to Muslim victims begins. This is to allow time for proper Catholic burial and mourning. More than 8,000 Bosnian Muslim men and underage boys from the enclave were captured and systematically killed by Bosnian Serb forces, while 30,000 women (many of them sexually abused and violently gang-raped by Serb soldiers) were expelled from the enclave under the auspices of the United Nations in the days after the fall of Srebrenica on July 11, 1995. The victims were shot and interred in mass graves, then reburied haphazardly later in more than 80 sites in a bid to cover up the evidence. So far, the International Commission on Missing Persons (ICMP) identified 6,481 victims of the July 1995 genocide through DNA method. "The number of reported missing for whom ICMP has blood samples as well as the matching rate between DNA profiles extracted from these bone and blood samples leads ICMP to support an estimate of around 8,100 individuals missing from the fall of Srebrenica in July 1995," stated the ICMP in its press release.